This is Inglis’ largest and most ambitious housing project to date. Inglis and Regan Development Corporation partnered to create Inglis Gardens at Belmont - 80 new, safe, accessible, affordable apartments in an integrated community on the 3.8 acres next to Inglis House (formerly the Carlene Apartments), at 2560-2564 Belmont Avenue. Forty units in the two building complex are what Inglis refers to as Accessibility-Plus units, meaning they exceed the standard design specs for compliance with the Americans with Disabilities Act (such as 40 inch doorways instead of the ADA compliant 36 inches to accommodate larger motorized wheelchairs). “Access to affordable and accessible housing, according to research, is by far the greatest need for people with disabilities in the Philadelphia region and beyond,” said Gavin Kerr, Inglis President and CEO. “Providing housing for people who choose to live in the community is also consistent with evolving state and federal policies – and we have worked closely with policy makers to find more ways to care for more people in integrated community settings while saving money for Pennsylvania and its taxpayers,” said Kerr. The $26 million project broke ground in the fall of 2014 and the first tenants moved in on Wednesday, July 13, 2016. Inglis Gardens at Belmont is the first project in the Commonwealth specifically targeted to people with disabilities, under the age of 55, transferring from long-term/nursing home environments to independent living. “These new apartments are vibrant, attractive and designed with wheelchair users in mind,” said Christine Lacy, Director of Inglis Housing Corporation. “Our thoughtful Accessibility-Plus design incorporates extra space for power chairs to maneuver; kitchens with reachable sinks, appliances and storage spaces; roll-in showers, and technology-enabled units allowing remote control of doors and much more,” said Lacy. 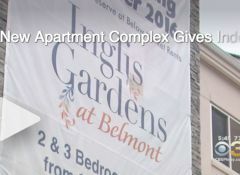 “It’s exciting to see a project like Inglis Gardens at Belmont come to fruition,” said Brian Hudson Sr., Executive Director and CEO, PA Housing Finance Agency. “An effort to create 80 new apartment homes for people with disabilities and other qualified families is made possible through the Low Income Housing Tax Credit Program, ensuring both the community’s stability and affordability,” Hudson said. Many people with disabilities who have lived in long-term care environments or with family, often have relied on others to manage their affairs. Inglis has created numerous programs internally, and worked with outside independent living advocates, to help train individuals eager to make this transition including managing finances, scheduling home care aides, managing your own doctor’s appointments and occupational therapy, to learn cooking skills, home management and more. In addition to investing in new apartments, Inglis is a thought-leader in developing programs that support people with disabilities who wish to live independently in the community. Virtual LIFE (Living Independently for Everyone) is a first-of-its kind consortium program of partners coming together to provide supports and services to those who choose to live on their own and enroll in the program. Disability-competent primary care is coordinated through PCOM’s (Philadelphia College of Osteopathic Medicine) Family Practice Group, the Magee Rehabilitation Hospital provides the services which make up the Magee Medical Home; reliable attendant care is provided by Home Care Associates; and Technology and Engagement services is provided through a variety of services including Durable Medical Equipment service coordination, Adapted Technology Assessments, Inglis Community Computing Program, Inglis House Wheelchair shop (for emergencies) and other providers. Since it opened its first independent-living apartment, the Morris-Klein Apartments, in 1975, Inglis has been a trailblazer in supporting people with disabilities who wish to live independently in the community building or developing nearly 300 apartment units and has plans for at least 44 more in 2017. Many of those first residents of Morris-Klein were former residents of Inglis House. Inglis is now the largest provider of fully accessible, affordable housing in the region.